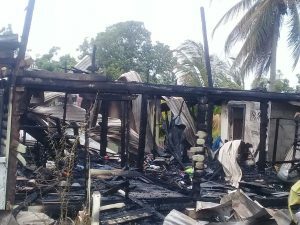 A family of six is now counting their losses and contemplating their next move, after a fire of unknown orgin destroyed the house at 116 Block 2 Albion, Corentyne home that they were renting. The fire which occurred on Tuesday at around 11am, reduced the two bedroom, two-storey wooden structure to ashes Nothing was saved. According to Gangi Ganesh, 58, a neighbour who was home at the time of the blaze, she felt heat emanating from the building. for children with disabilities located at Port Mourant. 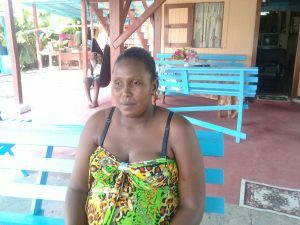 Her husband, Damion Simon, is a taxi driver. The burnt remains of the house where Teacher Shennisa Willie and her family lived. Meanwhile, the landlady, Soomattie ‘Pooni’ Mohammad , suspected that the fire was the work of arsonists. She noted that the neighbour, who she described as disrespectful, would always initiate disagreements with persons. She recalled several times during her time living at the property, reports had to be made to the Police Station after the said neighbour had allegedly stolen from them. She remain adamant “they always does be in problem and they would do something like that.” According to the woman, a report was made to the police station and an investigation was launched. The now homeless family calls for assistance. Should anyone like to assist Willie can be contacted on the numbers: 6725363/6138434.